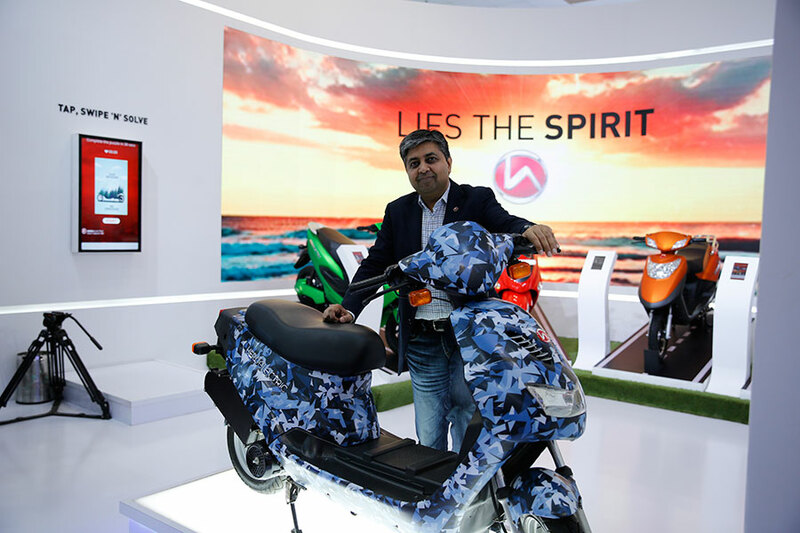 Hero Electric, the country’s largest electric two-wheeler manufacturer, today unveiled as many as eight of its global products in India, at Auto Expo 2018. The company plans to launch these products in a phased manner. We are proud to showcase our new range of electric two-wheelers, which have been especially designed for the aspirational Indian. The AXLHE-20, HE-19, HE-18 and HE-17 are high speed e-bikes that promise the perfect blend of performance and efficiency. On the other hand, A2B Blake, A2B Kroemer-MTB, A2B Speed and Kuo Boost are premium electric bicycles that cater to upwardly mobile youth who value adventure and fitness. The company also launched ‘10 Years Ahead’ campaign to mark 10 years of manufacturing electric two wheelers. 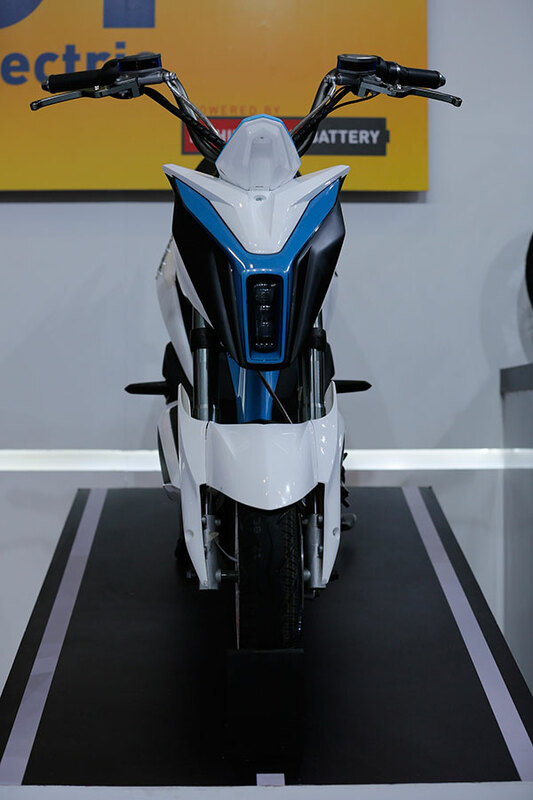 Over the past decade, Hero Electric has launched 15 electric two wheelers in India. 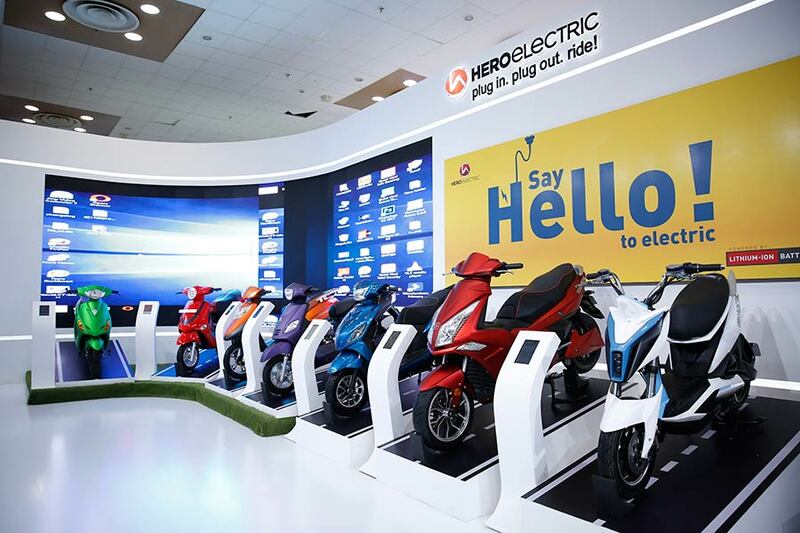 With 65% share of the country’s electric two wheeler market, Hero Electric leads India’s electric mobility revolution. Hero Electric has been leading India’s electric mobility revolution over a decade now. Our commitment to sustainable mobility is manifested in the consistently superior products that we have launched over the years. Our new product range is an extension of this commitment. Today, buyers are looking for products that are exciting, innovative and convenient. The AXLHE-20, HE-19, HE-18, HE-17 and e-bicycles A2B Blake, A2B Kroemer-MTB, A2B Speed and Kuo Boost are developed keeping in mind the needs and aspirations of such customers. These products are part of Hero Electric’s plan to double sales every year over the next five years. The company will add to its current manufacturing capacity by setting up multiple plants in that time period. Hero Electric’s upcoming high-speed e-bike, codenamed AXLHE-20, is powered by a 4,000 Watt motor that produces peak power of 6,000 Watts. The e-bike can reach a top speed of 85 kilometres per hour and has a range of up to 110 kilometres on a single charge. The lithium ion battery on the e-bike can get fully charged from empty in around four hours. It also features regenerative braking, which improves its performance. The HE-19 e-bike is powered by a 2500 Watt motor that delivers peak power of 4500 watts. It has a top speed of 75 kilometres per hour and a range of 60 kilometres per charge. HE-19 is equipped with a lithium ion battery that gets completely charged in four hours. It has an advanced LCD instrument cluster and disc brakes on both wheels. Hero Electric’s HE-18 e-bike is powered by a 1500 watt motor that gives out peak power of 2000 watts. It is equipped with a 60 volt lithium ion battery that gives it a top speed of 55 kilometres per hour and a range of 70 kilometres on a single charge. HE-18 has automatic LED headlights, a USB port with power indicator. The vehicle also comes with cruise control, smart connectivity and front and rear disc brakes. The HE-17 e-bike comes with a 2000 watt motor that is powered by a 60 volt lithium ion battery that gives it a range of 70 kilometres per charge. The vehicle has a speed cruise switch, three speed selection modes and a USB port on its handlebar. It also comes equipped with an advanced LCD instrument cluster. A2B is the UK-based electric bicycle-making subsidiary of Hero Electric Vehicles Pvt Ltd. Its Blake e-bicycle is powered by a 350 watt motor that has a top speed of 32 kilometres per hour. The e-bicycle comes with a 48 volt battery that offers a range of up to 80 kilometres on a full charge. The A2B Blake has an aluminium frame and weighs 18 kilograms. The A2B Kroemer-MTB is powered by a 250 watt motor. The e-bicycle’s 36 volt battery lasts for 700 full charge cycles and gives the electric bicycle a range of 70 kilometres along with a top speed of 25 kilometres per hour. A2B Kroemer-MTB has an alloy frame and weighs 23 kilograms. The A2B Speed e-bicycle is powered by a 500 watt motor. The Speed’s 36 volt battery lasts for 700 full charge cycles and gives the electric bicycle a range of 70 kilometres along with a top speed of 45 kilometres per hour. A2B Speed has an aluminium frame and eight gear Shimano XT rear derailleur transmission. It comes with Tektro Dorado hydraulic disc brakes. The Kuo Boost electric bicycle is powered by a 350 watt motor and has a top speed of 32 kilometres per hour. Its lithium ion battery gives the Kuo Boost 60 kilometres of range per charge. The battery lasts up to 700 full charge cycles. Kuo Boost has an aluminium frame and weighs 20 kilograms. It is a foldable electric bicycle and offers unparalleled portability and convenience. The bicycle has an eight-speed Shimano Derailleur gearbox to assist riders. The Kuo Boost is renowned world over, as the most successful premium foldable electric bicycle. 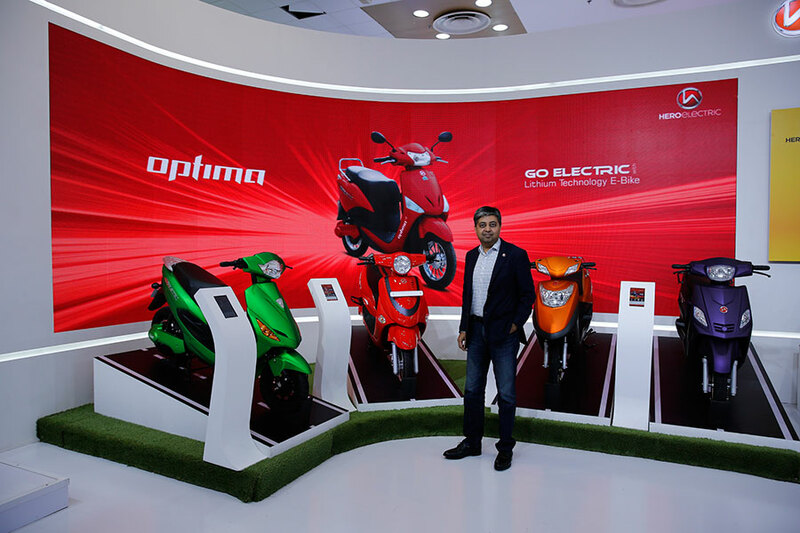 A pioneer and market leader in the Indian electric two-wheeler industry with its state-art-manufacturing facility at Ludhiana and Corporate office at Delhi, HERO Electric entered the electric two-wheeler segment after an extensive research. HERO Electric is the leader in its category. The company has a strong network of more than 500 touch points across the country. It is leading a revolution in electric mobility with over 200,000 happy customers. HERO Electric strives to provide an ecological and a socially responsible platform with the objective of making the country greener. The company believes in ‘Zero pollution’ transportation in the country through its wide range of Electric Vehicles.